Taking Fingers off Frets or Leaving them on? A question I have heard a few times (particularly from beginners) is whether to take fingers off the frets when not in use, or just leave them there? It can depend on the situation. If the finger is placed for a “pedal note” then generally it can remain where it is. A pedal note is a note that you come back to repeatedly while the other fingers do something else. For the fingers that do leave their frets, don’t take them too far from the fret-board. Aim for no more than an inch away. If you can’t get this then play slowly until you can. If we play the following C major scale using the starting root note as our pedal note, the 1st finger can stay where it is on this note (which is on the 5th fret G string). It can also stay in place on the 5th fret of the B and high E strings like a partial-barre. Remember to play these exercises at your optimum speed. By that I mean a speed at which you play clearly with no mistakes. If that is slow then all the better. For fingers 2 and 3, whether you take either of those off as early as when the next note occurs or later when moving to the next string, it is not as critical knowing that they are between the 1st and 4th fingers. Generally things tend to be a little harder to play on the guitar when going backwards. Below is a C major scale pedal note exercise (like previous Fig. 2) but played backwards using the higher octave of the root note as the pedal note (high E string 8th fret). The pedal note is now in front of other notes on the high E string so needs to move out of the way when not played. When the notes descend across different strings however (the B and G strings) the pedal note can remain where it is. Here are further finger combinations for similar exercises to the above: 1st and 3rd fingers two frets apart, 1st and 4th fingers three frets apart, 2nd and 3rd fingers one fret apart, 2nd and 4th fingers two frets apart and 3rd and 4th fingers one fret apart. It doesn’t matter which fret you choose to start from. Lower down the fretboard might be more difficult due to the frets being further apart. 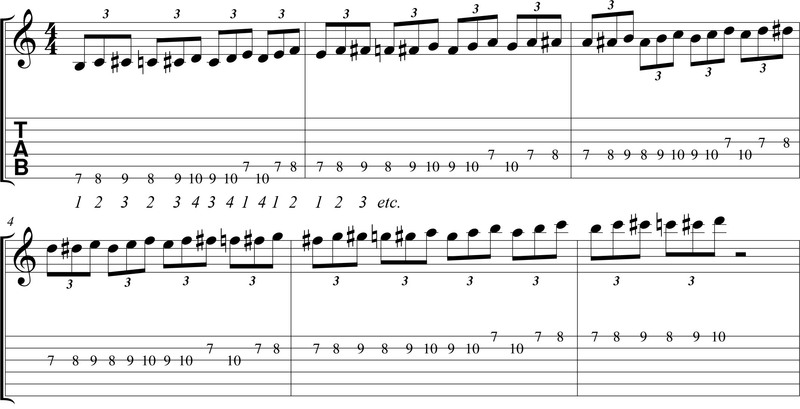 The above would also be reflected for any two note per string scale, such as pentatonic scales. 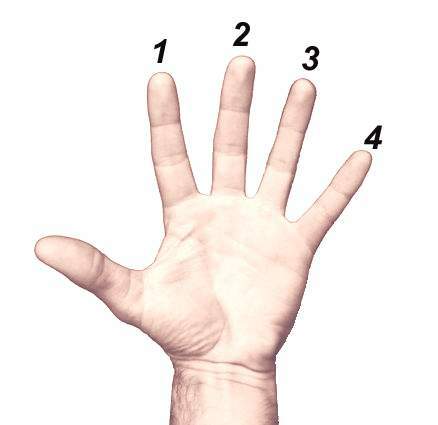 Below is the previous “1234” finger exercise (from Fig. 3) except now played in ascending sets of 3 notes. Some of the notes are now similar in function to the aforementioned pedal notes, in that you come back to the note once more. Therefore you can temporarily leave the finger on a bit longer for this note, rather than take it off then put it back on. This would apply to similar sequences used on most scales. Although at this point you can probably tell this tutorial is analysing the issue in some detail, practise will get you doing it out of necessity. After all my writing of all this is retrospective having already played the guitar. So whether to take fingers off the frets or leave them on? It depends on the situation. If you are not coming back to the same note any time soon, then normally you can take the finger off the fret when not in use, enabling it to move quicker to other frets when the need arises rather than remaining redundantly on a fret for a note that has already passed. It’s a bit like playing Badminton or Tennis singles; After each shot it is best, if possible, to return to the centre of the court in order to be able to cover as much of the court as possible for the next return shot. Likewise, if your finger is still placed on a fret for a note that has passed then it won’t be able to reach the next one as fast.